I have been cooking sweet potatoes a lot this past couple of weeks as I try to develop original recipes for my very first recipe contest. This one is very similar to the Sweet Potato Cakes I recently posted. I am using the same key ingredients but changed some o f the herbs and spices and with a very different presentation, it felt like a completely different experience overall. Just another example of how versatile sweet potatoes can be. The Sweet Potato Cakes were inspired by a traditional Bulgarian recipe for potato cakes (or potato kyufte). This one is inspired by a classic from Spain, the Spanish tortilla. Which regional or world cuisine inspires you most in your culinary endeavors? Set oven to 400 degrees. Gently grease the bottom of a baking sheet. Toss sweet potato cubes with cayenne, paprika and cumin. Spread on baking sheet. Drizzle with olive oil and a pinch of salt. Bake for 15-20 min or until sweet potatoes are tender but not too soft. In a sauté pan, on medium heat, sauté leeks until tender but not overcooked. Beat eggs with a pinch of salt and a pinch of pepper. In a large mixing bowl, mix leeks, sweet potato cubes, feta and parsley. Add eggs and mix well. Season with salt and pepper. In a small iron skillet, (I used a tiny 6 inch one for individual size tortillas), add olive oil to generously cover the bottom, about ½ inch deep. Heat oil on high heat. The oil needs to be very hot, but be careful not to burn it as olive oil burns easily. When oil is hot, pour potato egg mixture to fill the skillet. The heat will help the outside shell get hard, making it easier to turn around. Once the outside feels a little harder, turn the heat down to medium low. Cook this side until the mixture doesn’t feel runny anymore (5-6 min). It is important to lower the heat to make sure the inside is cooked without burning the outside. Turning the tortilla is the trickiest part of this recipe. To make sure it is ready, I run a spatula around the edge of the tortilla to feel the firmness of the mix. Once it feels like one piece, and not a runny mixture, it is ready. You can test it with shaking the pan as well. Using a small skillet makes it really easy to flip. Cover the skillet with a plate and turn over. Add oil to skillet if needed. Let it heat. Slide the flipped tortilla back into the skillet. Cook the other side for another 4-6 minutes on medium-low heat. I don’t like to overcook it so I check the consistency to make sure it is firm but not too hard. Repeat for remaining portions. Make sure to remove any tortilla pieces from skillet between each portion so that they don’t stick and burn. 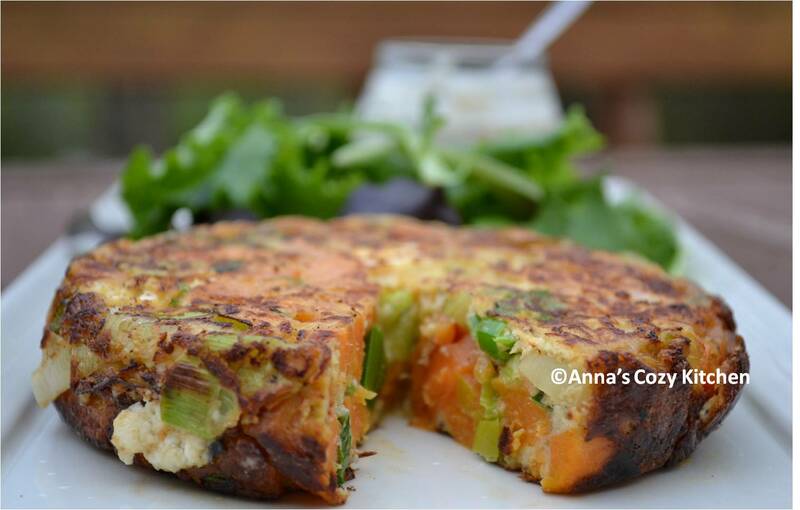 This entry was posted in Appetizers, Main Dishes, Vegetarian and tagged Eggs, Feta, Leeks, Omelette, Parsley, Spanish Tortilla, Sweet Potatoes, Vegetarian. Bookmark the permalink. Love sweet potatoes. The addition of feta is a flavor combo I have never had, but certain I would enjoy. Feta actually works really well with sweet poatatoes. Think feta and watermelon, a perfect combo of sweet and savory. Kind of similar here. I tried it with goat cheese too but it is a little too mild and gets a little lost. Anna — I wish you the best of luck with your cooking contest. This recipe sounds delicious. What kind of sweet potatoes do you recommend? I think I usually choose those that are too pulpy. I buy the ones that are on sale. How you prepare them makes a big difference. If I boil them, I try to boil with the skin as they don’t get too watery that way. If I cook them in the oven I make sure I don’t overcook. Higher heat for shorter time seems do deliver a better result. Pingback: Tortilla Espagnola (Spanish tortilla) « What's for lunch? How to spend $200 at Williams Sonoma and a big thank you!